Nestled along the Atlantic Coast in St. John’s County, St. Augustine, Florida hosts some of the Nation’s most popular real haunted places. St. Augustine has been appropriately named the “Nation’s Oldest City”. To most locals, this area is known as the “Ancient City”. In addition to being the oldest city in America, it is also considered to be one of the most haunted places in America. Locals and visitors alike have experienced a wide range of unexplained phenomenon, captured amazing ghost pictures while strolling the cobblestone streets, and have even found that when they were video taping various areas that they ended up with some spectacular ghost videos. Here, you will learn about several of the real haunted places in St. Augustine, Florida. As time progressed, this particular fort stood as a battleground several times. Many sought to defend and overtake the establishment, but none succeeded. When certain groups wanted to ensure their safety, as well as the safety of their families, the walls of this particular fort protected them. This immense structure took a full twenty-three years to build. The construction came to an end in the year of 1695. It was carefully composed of “coquina” which is a native limestone. Various types of sea shells and even bits and pieces of coral are included in the limestone. Three hundred years of battles and violent storms have not shaken the fort. 1. In the watch tower that is closest to the road, it is said that a light ignites on nights that are relatively stormy. There is no power going to this particular light. Residents and locals that are familiar with the fort often overlook this unexplained phenomenon, but for the avid ghost hunter, seeing this makes for a remarkable experience. 2. It is not unusual for a solider that is lavishly dressed in clothing that represents the era of the Spanish to be seen looking out to the vast sea. This is normally experienced when the sun is just starting to rise, or when the sun is setting. 3. In the dungeon of the fort, many individuals have experienced strange sensations. These sensations include goose bumps, breezes, the feeling of being touched, and many individuals have even experienced physical sickness in the dungeon for no apparent reason. 4. Many ghost pictures and ghost videos have been taken at this particular monument. It is not uncommon for individuals to capture strange lights, orbs, rods, spheres, and even distinct apparitions composed of strange mists. 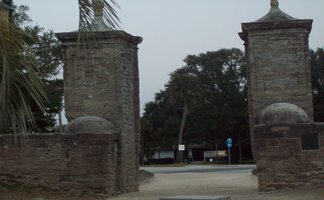 There are two other forts in St. Augustine that are also considered to be some of the most haunted places in the city. 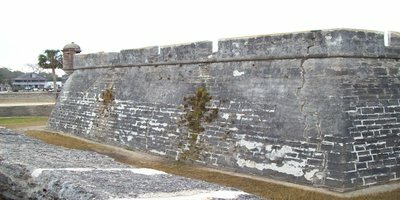 Fort Mose is in the North area of the city, and Fort Matanzas is in the South area of the city. If you are interested in unexplained phenomenon and real haunted places in America, you should definitely consider a trip to these forts as well. 1. In the year of 1873, on the 10th day of July, there was a tragic accident that occurred while the lighthouse was being constructed. Five kids were riding along a type of cart that assisted in bringing in supplies. They fell in the water as a result of the cart breaking. A black girl that is believed to have been a servant, as well as two other girls drowned. Many stories circulate that these girls swing on the swing set on the grounds, can be heard playing and laughing, and can even be seen looking from the windows of the house on the grounds. 2. On Ghost Hunters, a shadow was documented on film moving on the top level of the stairs inside the lighthouse and even in front of the window in the lighthouse. It is believed that this is a spirit of a light keeper that tragically fell from the structure. In addition to this, a woman’s voice was also recorded in digital audio recordings that the TAPS Team took. The TAPS Team has determined that this area is definitely haunted and has returned to document even more occurrences. 3. Many different sounds have been heard in the Museum on the property. None of these sounds seem to be threatening. The employees have different stories when it comes to what they hear, but they are so used to the sounds that they simply overlook them most of the time. 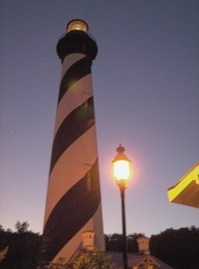 Check out this video of Ghost Hunters at the St. Augustine Lighthouse. If you want to experience real haunted places in St. Augustine, you should ensure that you bring along a camera, a video recorder, and even some type of audio recording device. You will be amazed at the energy and paranormal activity that you capture in St. Augustine, one of the most haunted places in America! Join the Ghosts and Gravestones Tour of St. Augustine for a haunting experience on this city's ''Frightseeing'' Tour. Included is a visit to the town's most haunted building, The Old Jail. Explore the darker side of the Nation's Oldest City, if you dare! Get your tickets online at discounted prices today! A big thank you goes out to Angie Shiflett for her generous contributions to this article!